Ready to be spoiled rotten?? Sometimes friends or I throw showers and so I end up designing a few things for them. AND. Rather than letting those delicious files that I poured into sit in digital idleness and waste, I am here sharing them with you for free so you can go nuts and throw a ridiculously adorable baby shower of your own. SOCK MONKEYS. Are they not the cutest, hippest thing out there now?? 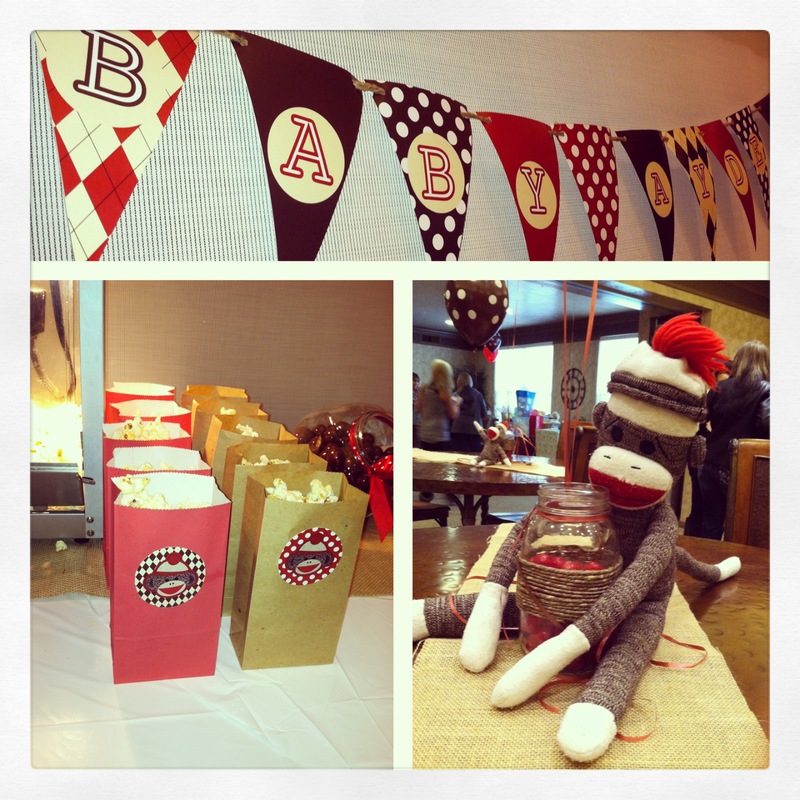 Well, I must give credit to my friend, Amanda, who had the genius of throwing a sock monkey baby shower. 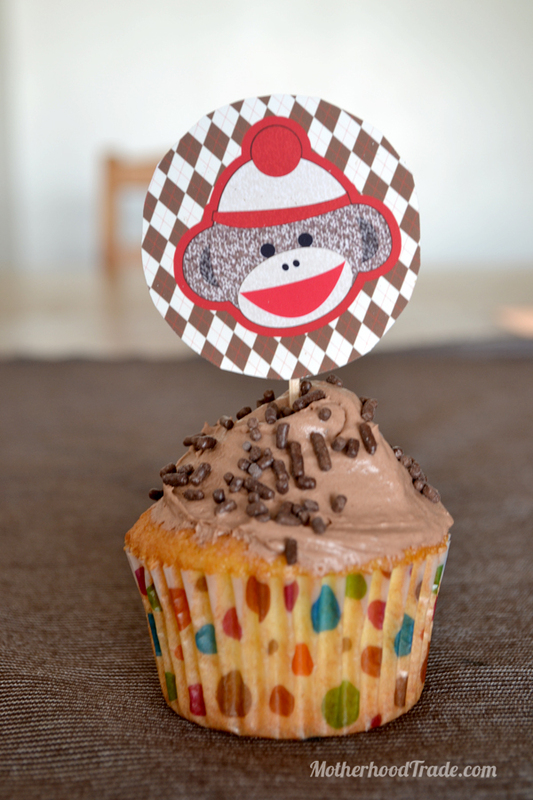 Turns out there are some PRE-EETTy insanely charming party ideas with a sock monkey themed shower out there. Who knew, monkeys made of knitted footwear= gushingly cute. This download includes a banner with the words “Little Monkey” and also includes extra patterned triangles if you just want to decorate and/or not include the letters. To assemble you can fold top over some string and glue or staple -or- punch two holes on the top corners and thread a string through (as shown below). This is one of my faves. I suggested some advice cards and with the monkey theme we figure it would be awesome if we could little monkeys hanging on a branch with advice on it. This is what I came up with. What is great is that once advice is written and hung others can take a tour of the monkey tree and enjoy reading the little cards during the shower. Please respect my work. Please give proper credit and link back if you display on any website. Do not use for commercial purposes. For updates on the lastest party printables stay connected through facebook. Need the party invites to go with it all? Since it is something that needs to be customized, I put some in my shop if you would like some made. 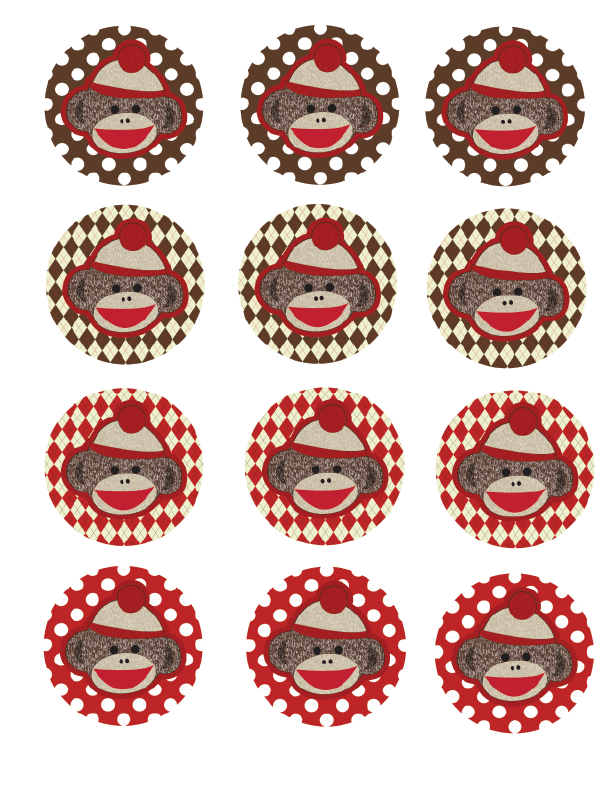 Here are some printable sock monkey thankyou cards available as an instant download on Etsy. Hmm…try this link http://motherhoodtrade.com/wp-content/uploads/2013/02/sock-monkey-advice-card.pdf on firefox or chrome, you should be able to view it right on your browser and print/download from there! good luck, let me know if you have issues. Hello! I want to let you know how much I love your ideas, and that it is being used next week for a sock monkey shower. I am so grateful for you sharing you fabulous skills, it will be the icing on the cake! I cannot get the banner or circles label files to open! I would like to use them for my son’s first birthday! Thanks. You’ve clicked on the link to download? Nothing happens? Let me know. I figured it out! I had to use a different web browser. Thank you! Hello…we are hosting a co-ed baby shower and would LOVE to use the monkey tree tags. Was wondering if there is a way to change ‘mommy to be’ to ‘parents-to-be’ and also changing the color to lime green or yellow? Many thanks! Do you do custom invitations as a JPEG? I love the monkey face you have on the labels with the colors/patterns you have….just want to combine them all into an invite! Yes, it is $15 per file. 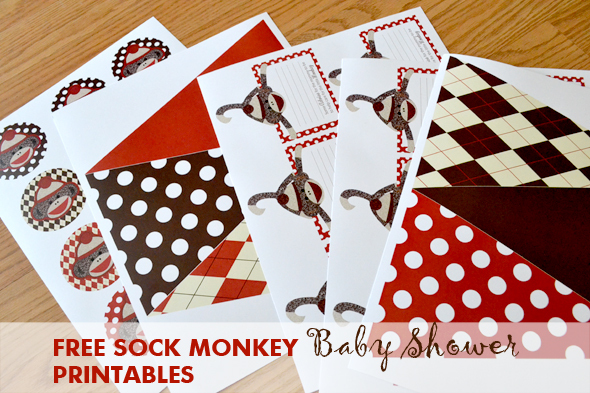 I am having trouble printing the sock monkey free printables. Hey there, were you able to print it out? What issues are you having? Yes, my site is having issues right now, thank you for your patience! I working on solving the issues.